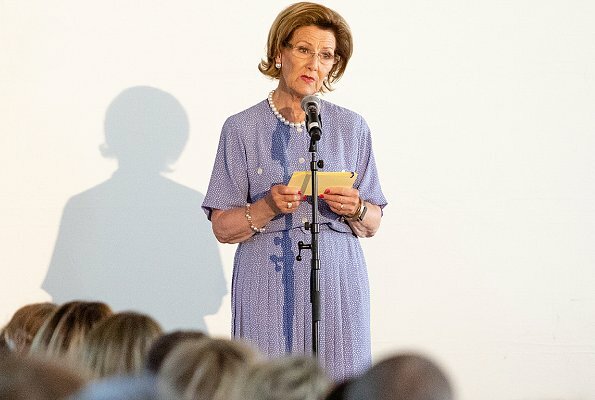 On June 8, 2018, Queen Sonja, Crown Prince Haakon and Crown Princess Mette-Marit attended the 5th anniversary of the SIKT conference at the Royal Palace in Oslo. SIKT is a gathering point where about 200 young leaders and talents in the age of 20 to 40 are gathered after being invited by Crown Prince Haakon. It is one of the Crown Prince’s own initiatives. The purpose is to make a relevant and fun arena for original thinking and discussion. Participants come from all over the country and from all sectors; business sector, public sector, organisations, culture, academia, media and sports. I like Queen Sonjas hairstyle very much. The highlights are superbe and the cut is modern but mature. Her dress is also an eyecatcher. Nice colour and fitting. Oh boy, that´s not good. Mette Marit ist shining, but I think, the dress' upperpart isn't good for her. She has a bigger cup size and this dress is to wear loose-fitting like the skirtpart. One size bigger could be better for her. Why is she wearing clothes that make her look 15 kilos more than she does, and overblown? She needs a SUPPORTIVE BRA! Diane, I honestly don't even think she's wearing one. Her hair is very pretty, nicely styled. But just cannot say anything good about that dress. And please, someone take her to a good undergarments shop where she can be measured and fitted properly. Q Sonja looks very nice love her dress,she is a classy Lady.Why is Pss MM doing this every time,Why not embrace how she is wear her dresses a size larger and maybe no high neck and rushing in the front,I think she would look fantastic. Her hair and make up is good so is her smile. She is in serious need of a stylist, but she also needs to listen then what and how to wear things OMO of course. Queen Sonja looks lovely as usual. I think she is the best dressed by far of her peers. She is always very well groomed and her outfits suit her body type beautifully. On the other hand MM dress in and of itself is quite a nice dress but not for her body type. She is in serious need of proper fitting undergarments. Her chest is sitting on her middle. Just no! At 80 years old, Queen Sonja looks wonderful. Her hair is beautiful and chic, her dress lovely. I think she is one of the best dressed ladies among European royalty. She gives the young ones a go, especially her daughter in law. I agree. Queen Sonja is looking elegant and beautiful as always. Since I don't want to cry, I have fun in reading most the comments. I can only agree on the comments about the underwear. I think she should speak about it with Camilla, she manages it better. Yes her dresses should take into account morphology requirements.